Thanks to many years of experience in a Reed Technology design and production, Standex Electronics is able to provide highly specialized Reed Relays which meet the most demanding requirements of various applications. Reed Relays are ideally used for switching applications requiring low and stable contact resistance, low capacitance, high insulation resistance, long life and small size. For specialty requirements such as high RF switching, very high voltage switching, extremely low voltage or low current switching, Reed Relays are ideal. 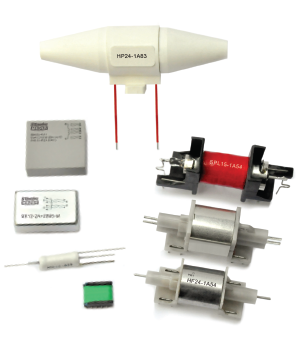 Custom reed relays are designed to offer specific features and parameters, such as a latching function, very high insulation resistance, different shielding options etc., and thereby appropriately complete our product range of standard relays. Do not hesitate to contact our sales offices for further information, our engineers will gladly provide you with all the necessary information and documents about our customized relays, their parameters and availability.